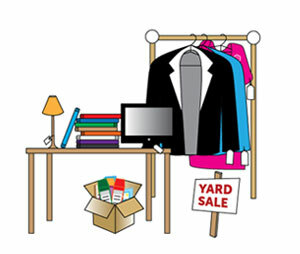 Want to host a yard sale? Moving is a great reason to clean house and get rid of all the stuff you no longer use. Plus, the more you lose now, the less you’ll have to pack later, and the more money you’ll save. Organize Your Stuff – Before the sale, sort your belonging into groups, and make them presentable so that people will want to buy them. Communicate – Discuss what you are selling with your family so that things of sentimental value aren’t accidentally sold away for $1. Get Materials – You’ll want several cardboard boxes in which to put items. You’ll also want permanent markers, tape or stickers for pricing (always label! ), poster board for signs, balloons for flagging your location, and possibly tarps if you’re setting things on the ground. You’ll also want a decently-sized, locking cash box. Set Prices – You can price similar items collectively, but generally make sure that each item has a price tag. Haggling is fun, but it can become burdensome if you have to do it with every customer. Using labels is the best way to price things. Have Cash and Change – Make sure you get lots of quarters, ones and fives before you start your garage sale. Recruit Manpower – Don’t try to have a garage sale alone! Invite family and friends. Advertise – Pick a day that most people are off work, usually Saturday and Sunday, and a day when the weather is agreeable. Then put out the word on Craigslist and by placing signs around the neighborhood and at nearby intersections. Offer Cookies, Coffee & Other Services – People like free stuff, so offer coffee, bottled water, lemonade, crackers and/or cookies. It is also a good idea to have a mirror so people can try on clothes, and an electrical outlet so people can try the electronics, and wrapping for fragile items. Above all else, have fun. A yard sale is a good way to meet people, converse with neighbors and share a valuable experience with friends and family. Learn how to save money in other ways.